1. Take a 10 Kg weight to a height of say 10 metres – makes the numbers nice and easy. 2. Place your foot directly below the weight. 3. Allow the weight to fall. 4. Use the stimulus of pain as a focus for meditation on the issue of certainty in science. 5. Use the period of convalescence to learn the sort of basic physics that may stop you doing anything as stupid again. David (replying to Pete D.)– can you tell us which studies you’ve looked at that you don’t find definitive or convincing? That would help narrow the list to consider what might be useful. Is western Alaska’s snowicane a record breaker? which is very good IMO. However, that study (and many others) fails to confirm that there are areas with decreased average rainfall but increased extreme rains. I’m certainly prepared to believe that so-called desertification will lead to such a result, but I’d like to see some evidence. I believe Northern Norway has had a couple of storms of similar intensity, and certainly some Antarctic coasts and Southern Ocean islands, but otherwise it’s pretty close. Definitely that’s a storm that imho qualifies quite high on the NH snow storm list, though I don’t know if there’s a comprehensive list made anywhere. We had a beaufort 10 snow storm last year and that too was pretty nasty. Hank Roberts @55 — That was both prompt and exactly to the point! Moreover, the variations by locality are also of interest. Good find. The changes twixt die and dice are quick. Yes, we’ve been losing our adverbs really quick. I am confused. Well I understand that “If your series is n points long, then the probability that the last point is the hottest (and thus a record) is simply 1/n”. This is true for every point if you look at the whole dataset. However, a record (in my opinion) is not independent. When I role a dice, the every throw is independent of each other and therefore the probability of each throw to give a ‘6’ is 1/6. But if I look at the probability of the following throw being a record, this is not independent of the throw before. Example: I throw a 4. then the probability of the next throw being a new record (menas a 5 or a 6) is 1/3. If I throw a 1, it is 5/6. Looking at the series afterwards, of course everyone of this 2 throws has the probability to be the record. So in a linear climate, I expect, that new records tend to go near zero. Where do I think wrong? Allen and Soden 2006. Atmospheric Warming and the Amplification of Precipitation Extremes. Min et al. 2011. Human contribution to more-intense precipitation extremes. 124. Trenberth KE, Dai A, Rasmussen RM, Parsons DB. will it rain? J Clim 2007, 20:4801–4818. IMHO the loaded dice example is a good one for understanding what the 80%, means. If you know you have a loaded dice with that rolls a 6 5 out of 6 times there is an 80% chance when you roll a 6, you would not have gotten it if the dice was not loaded. You are absolutely correct that if there are only 6 discrete values, you have 0% chance of rolling a higher number if you have already rolled a 6. Which brings us to the 1/n question. If have n unique numbers, there is a 1/n probability that the last one is the highest independent of the probability distribution. I do not think this is a good assumption on temperature data though, and I doubt they used this approach in the paper. If we characterize the distribution of temperatures, and the high, we should be able to calculate the probability that a new temperature exceeds that one. Now the paper did not take into account climate variability in the “non loaded” case, so we are comparing data for a non-variable or stationary climate versus the current one. Have intense Northern Hemisphere winter storms increased in number? The material for this post comes from three sources: the 2007 IPCC report, a 2009 review titled, Extra-tropical cyclones in the present and future climate: a review, and Weather and Climate Extremes in a Changing Climate, a 2009 report from the U.S. Global Change Research Program (USGCRP). An increasing number of intense winter storms in some regions of the Northern Hemisphere over the last few decades of the 20th century was a common theme of many of the studies reviewed. However, the studies used different measures as to what constitutes an “intense” storm, and have some disagreement on which areas of the globe are seeing more intense storms. A 1996 study by Canadian researcher Steven Lambert (Figure 2) found a marked increase in intense wintertime cyclones (central pressure less than 970 mb) in the latter part of the 20th century. Most of this increase occurred in the Pacific Ocean. Other studies (Geng and Sugi, 2001, and Paciorek et al., 2002) found an increase in intense winter storms over both the North Atlantic and North Pacific in the latter part of the 20th century. Benestad and Chen(2006) found an increase in the number of intense storms over the Nordic countries over the period 1955-1994, but no trend in the western parts of the North Atlantic. Gulev et al. (2001) found a small increase in the number of intense North Pacific storms (core pressure below 980 mb), a large increase in the Arctic, but a small decrease in the Atlantic. McCabe et al. 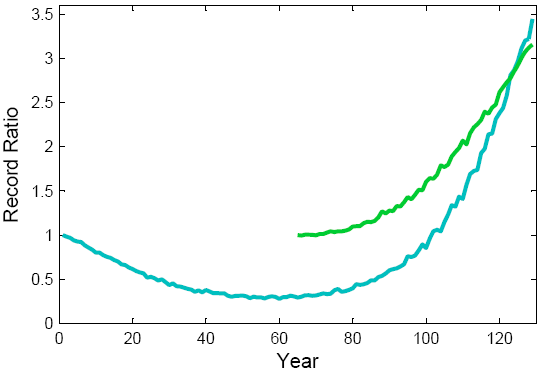 2001 found an increase at both mid-latitudes and high latitudes, particularly in the Arctic. Hirsch et al. (2001) found that the number of intense Nor’easters along the U.S. East Coast (storms with winds > 52 mph) stayed roughly constant at three storms per year over the period 1951 – 1997. Over the period 1900 to 1990, the number of strong cyclones (less than 992 mb) in November and December more than doubled over the Great Lakes of North America (Angel and Isard, 1998). With regards to Europe, Lionello et al. conclude, “the bulk of evidence from recent studies mostly supports, or at least does not contradict, the finding of an attenuation of cyclones over the Mediterranean and an intensification over Northern Europe during the second part of the twentieth century”. The IPCC AR4 (cf. Trenberth et al. 2007, p. 312) states that the detection of long-term changes in cyclone measures is hampered by incomplete and changing observing systems. Recent studies found, however, a general reliability of results for cyclones in the Northern Hemisphere. There are no sudden shifts in intensities that would indicate inhomogeneities, and also a comparison with cyclone activity estimated from regional surface and radiosonde data (Wang et al. 2006b; Harnik and Chang 2003) confirmed the general reliability of the data”. However, the data is not as good in the Southern Hemisphere, so the finding that intense winter storms are also increasing in that hemisphere must be viewed with caution. “Haughty”? Resort to name-calling is a fairly certain indicator that the commenter really doesn’t have anything substantive to add to an argument. I admire Gavin Schmidt, Eric Steig …all the folks at RealClimate. The very fact that they allow relevant debate to continue on this website is to their credit. So, when someone says they are “irritated” that RealClimate allows the debate to continue, because “the debate is over” I’m inclined to defend what I regard as completely appropriate dialog on the many uncertainties about climate science that remain. I also respect that they don’t bother to discuss every disproved conjecture of some folks – why waste time on what has been disproved, when there is so much remaining to discover and understand. Comments about the Earth orbiting the sun, etc. seemingly betray a lack of understanding that despite all the advances scientists have made in understanding orbital mechanics, even with Einsteinian relativistic effects included, our models still fail to predict with complete accuracy the Earth’s orbit. In other words, there is opportunity here for further discovery, at least for those willing to look further. Comments about “phlogiston” and the like are also disappointing. There is still a great deal we do not understand about the nature of space, electromagnetic radiation, gravity, the strong force, and the weak force. We don’t understand mass and how it comes about, nor why quarks seemingly have the masses they do, or why their masses don’t add up to the measured masses of protons and neutrons. You want certainty? Sorry, you will be disappointed. Even though we may someday be able to see beyond the vail of Heisenberg’s uncertainty principle, uncertainty will remain. Extreme? About 1,000 people died in Southeast Asia floods: UN. 1. The debate over the reality of the post 1975 warming is over. 2. The debate over the primary human role in most/all (I say ‘all’) of this warming is over. Because CO2 is a primary driver of the post 1975 warming it must have had a role in the pre-1975 warming, the physics of the matter didn’t suddenly apply after 1975 and not before. So while claimed solar correlations prior to 1975 may well be correct, there was a background of warming due to CO2 which has been increasing since the late 1800s. Yes there are issues still up for discussion – that’s why I read the science as an amateur. Were there no issues for dicussion it wouldn’t be an interesting branch of science. The valid question is what to do. Key to deciding that is what impacts we will face, since severity of impacts is a crucial consideration in any cost-benefit decision. To say anything of worth about that I need to read more: I had thought that whilst the AGW signal emerged from noise around 1975 the signal of AGW related weather events was still within the noise. I now suspect it is starting to emerge from the noise of natural variability in key regions and key indices. You evidently do not understand scientific uncertainty. It is knowing the uncertainties that allows us to proclaim with high confidence that a satellite that we slingshot off of half a dozen celestial bodies will arrove at its intended target on a day certain. That is certainly good enough for most purposes. Likewise, we can state with near certainty that adding CO2 to the atmosphere will warm the planet–and with high confidence about how much. We have reached the point where it is no longer profitable to argue about whether CO2 is a greenhouse gas. It is. And once you have 97% of experts agreeing on anything–even if it is where to go for dinner–you can pretty much take that to the bank. If you require certainty, may I direct you to the theology department. Will RealClimate have a post on Hansen’s new paper where Hansen shows that the area of the Earth with a greater than 3SD heat anomaly has increased tremendously? I would be very interested in what scientists think of this paper. If the 3SD anomaly was 0.5% of the Earth in the 1960’s and is 10% now, does that mean that 95% of the anomaly can be attributed to AGW? Can a % of the 3SD anomaly be attributed to AGW in a scientific way? is there a website that would show all the hi and low records set GLOBALLY on a given day? also, is there a site showing the “running” or current global average temperature (and how it compares to “normal”)? i’d like to be able to illustrate how just because it’s cold here, it’s not cold GLOBALLY. I second Mr. Sweet’s call for a discussion of the Hansen paper. I really like Figure 4, which summarizes well the evolution of the temperature anomaly distribution over the decades. I would really like to sees the same graphs for precipitation, humidity and pressure. I think that this is the new paper from Hansen about climate extremes. Except, of course, for them as is profiting from the uncertainty and delay. Cough. You guys from RC will never stop amaze me . You even wrote a paper about july 2010 heatwave , it was a blocking high , and what happens in cases like that ? On one end you get unprecedented heat and unprecedented cold on the other one . Its not that hard to work out . No, a blocking event will get you high temperatures–not necessarily a record–and it certainly won’t get you a 3.5 sigma event as we saw in Moscow. If you learned some math, perhaps you wouldn’t be continually amazed. I now know why the price of pecans has gone up. Ray thanks for reply . I dont dispute that was 100year event , but if you spent so much time writing your paper you could have mentioned Siberia was 8deg below normal. Its pretty much obvious the blocking high was a1500km east from Moscow , and on eastern side of the high , cold air from Barents sea was drawn into Siberia . The blocking High was 1500 east from Moscow , and on the eastern side cold air from Barents sea was drawn into Siberia , if you spent so much time wring a paper about it you mentioned it too . Vlasta @76 — Based on historical records, it was more like a 1000 year event. I read that Hansen paper yesterday and blogged on it last night – the implications are very disturbing. I’d go so far as to suggest that if you don’t find it unsettling, you don’t understand it. The meteorological conditions leading to the 2010 Russia event are not relevant to the paper’s methodology or findings. Just as the fact that fires have happened naturally before humans would be irrelevant in a trial for arson. Figure 2 of Barriopedro et al puts the 2003 and 2010 European Heatwaves into the same perspective as Hansen 2011. That figure also shows the shift Hansen finds. The bottom line is that Hansen et al 2010, Rahmstorf & Coumou 2011, and Barripedro et al 2011 all* support the contention that the 2010 Russian Heatwave event was very unlikely without global warming – a warming driven by human activity. Dr Rob Carver of Weather Underground considers the 2010 Russian Heatwave to be a 1000 to 15,000 year event assuming a stationary climate – see here for detail and caveats. *Paywall-free links to all those papers here, bottom of page. I contributed this post on much the same topic to Skeptical Science last year. Examining figure 6 from Hansens paper, the cooling in Sibera you mention was a 1 sigma event, hardly unexpected. In addition it was much smaller in area than the Moscow 3.5 sigma heating. Please provide a reference for your extraordinary claim that the Siberia heat was unusual. FWIW, I reached the same chilling conclusion you blogged about when I read the Hansen paper. Two things struck me: I don’t know that this has been peer-reviewed, and you have to have a moderate understanding of math/stats to appreciate what it is telling us. Frankly, it is so simple, I’d like to see critics try to poke holes in it. So, the attacks on it will come in the form of tangential issues, or from those not skilled at math. I heard once that any idiot can make something complicated; it takes genius to make something simple. There is beauty is this one’s simplicity. I think the most important trick this paper accomplishes is to convey that, while it is true that you can not say much about any isolated event, these events are not isolated. A remarkable feature of Figure 3 is the large brown area (anomaly > 3 σ), which covered between 3% and 6% of the world in 2003-2008, and between 6% and 13% in the past three years. If temperature anomalies were normally distributed, and if anomalies were similar to those of 1951-1980, we would expect the brown area to cover only 0.1-0.2% of the planet. Whenever you bring up weather extremes such as the heat wave in Russia or the flooding in Australia there is a pretty good chance that the “skeptics” are going to say something to the effect, “Well, during any given year there is always extreme weather somewhere, highly unusual for one location or another, but if you were to look at the globe as a whole it really wouldn’t be that unusual.” However, that particular paragraph really puts some numbers on it. When the evening news begins with: Today, the debate over Global Warming,…”, that’s a lie. There is no debate over Global Warming. There is a debate over ‘modals’, math, probabilities, statistics,…but not over Global Warming. The debate is over refinements. No debate over CO2 in the atmosphere. No debate over temperature rise. Freidman and Smith use the ‘invisible hand’ as a metaphore proving that ‘Laissez Faire’ generates a more robust system. Unfortunately, as the ‘invisible hand’ put the last propellar on the International Debt Market, the wheels fell off. Laissez Faire (deregulation) produced a catastrophe in the US Banking System, US Housing Market (read ‘Liars Loans), and now,International Sovereign Debt. Laissez Faire produces a house of cards. Should not the world be warned that there is an intersection coming up between weather and agriculture? Should not the World be warned that the systems of Supply, Distribution, and Finance too fragile to withstand the coming onslaught? Should they not be told, “These are facts; these are hypothesis.”? If the death of a billion people can be reduced to 900 million,is it a worth while thing to do? Which is far from the truth. If hansen et al is correct, then their are only three possibilities – the standard deviation is incorrect, the variation is increasing, or it is random chance. Now the variation is much higher than global warming in these cases. Rahmstorf and Coumou specifically assume variation does not change with warming, and since they did not do attribution nor account for climate variation, Hansen et al. and Barripedro et al. would lead someone who understands statistics to say they can not attribute it to warming and not variation. Note they do not do any attribution in the paper, and never look at climate variation. Now there is the possibility that global warming is causing an increase in standard deviation or causing these climate variation events such as atmospheric blocking. The main paper that examines this is Dole et al. with the Russian Heat Wave, and it can not find attribution. Someone needs to do a great deal more work to find causation between global warming and the russian heat wave if it is to have a scientific basis, and not just a political argument. If climate change is going to cause things like the russian heat wave, the mitigation may be to have better hvac in those areas which will actually increase ghg. Most deaths were related to alcohol or inhalation exasperated by lack of air conditioning following the drought induced wild fires. their [sic] are only three possibilities – the standard deviation is incorrect, the variation is increasing, or it is random chance. You left one out: the mean is increasing. That’s the entire point of Rahmstorf & Coumou — to show that even when the standard deviation is larger than the warming, warming still makes such extremes much more likely. That’s why the Russian heat wave was so much more likely with global warming. A blocking event makes a heat wave — global warming makes it a once-in-a-thousand-years heat wave. The truly sad part is, it’s no longer once-in-a-thousand-years. If it is 3 sigma greater than the mean, it doesn’t matter if the mean is higher. If you mean that the 3 sigma gets higher sure, Rashmstorf and Coumou did not even look at what made the heat wave so bad. The legth of time, the droughts, etc. For the grid, the russian heat wave had an average july temperature of almost 4 standard deviations from the mean, for june, july, august it was 3. You left one out: the mean is increasing. That’s the entire point of Rahmstorf & Coumou – to show that even when the standard deviation is larger than the warming, warming still makes such extremes much more likely. 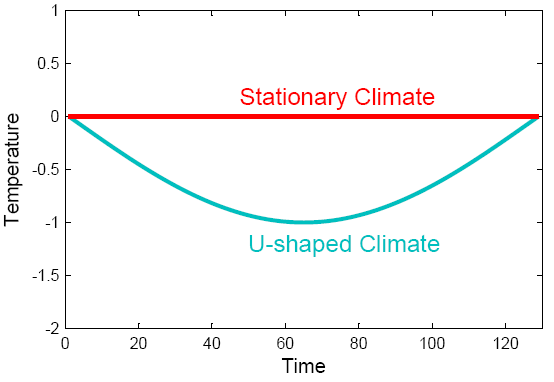 The stochastic model discussed above assumes that the statistical distribution of temperature anomalies does not change but is merely shifted toward warmer temperatures, which holds for the two datasets we analyzed here (see Methods). In addition, the distribution can also change itself-possibly it could widen in a warming climate, leading to even more extremes (5, 20). Specific physical processes can alter the distribution of extremes. For example, for the European heat wave of 2003, a feedback with soil moisture has been invoked: Once the soil has dried out, surface temperatures go up disproportionately as less heat is converted to latent heat near the ground; in other words, evaporative cooling becomes ineffective (20). 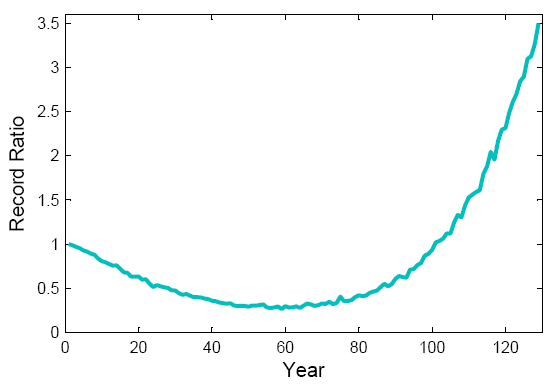 Although such mechanisms may play an important role and possibly aggravate extremes, it is nevertheless instructive to consider the first-order baseline discussed in this paper, namely, the effect of a simple shift of a random distribution toward warmer temperatures, “all else remaining equal.” Even this simple case demonstrates that large changes in the number of records are expected to arise due to climatic warming. They don’t deny that variability may increase, in fact they acknowledge as much. But for the sake of instruction they consider the simpler case where variation remains the same and the baseline moves in order to demonstrate how a little warming may make extremely unlikely events far more likely. Now there is the possibility that global warming is causing an increase in standard deviation or causing these climate variation events such as atmospheric blocking. The main paper that examines this is Dole et al. with the Russian Heat Wave, and it can not find attribution. The Dole et al paper “Was there a basis for anticipating the 2010 Russian Heat Wave” is superficial and does not come close to answering the question in an appropriate manner. Many statements are not justified and are actually irresponsible. The question itself is ill posed because we never expect to predict such a specific event under any circumstances, but with climate change, the odds of certain kinds of events do change. The SSTs were exceptionally high in the Indonesian and northern Indian Ocean regions, partly as a consequence of the previous El Nino (that lasted from May 2009 to May 2010), and partly from global warming. The high SSTs fed enhanced moisture into the monsoon, giving rise to the flooding, and helped drive a strong monsoonal circulation that had a direct downward component right over southern Russia. The change in atmospheric circulation that made the heatwave so intense wasn’t due to a change in variability, a moving of the baseline, or a moderate El Nino. Rather, it is reasonable to conclude that each of these played a part. Each was a factor. And thus certain highly improbable events become much more probable under global warming. Because of the accumulated ocean heat content and CO2 it will not be cool globally for many thousands of years. Perhaps you could teach your friends some amazing natural history like winter is cooler than summer in the hemisphere that is having winter at the time, or some advance technical concepts like “average”. You can check by month. Pick any month and it is warmer than it used to be. Look for the anomaly at the top right of the map. La Niña years are globally “cool” but they are now warmer than El Niño used to be. thanks much, pete. i really appreciate your answering. that first link you gave is pretty cool – so i can show them the current month. what i’d really like is something for TODAY (or even yesterday). i want to be able to show someone who during a snow storm says, “how’s that global warming going?” that it’s warm pretty much everywhere else today, right now. i don’t want anything nuanced about yearly, monthly averages. i’d like to know the global average for today, and possibly the number of cold vs warm records set yesterday. “skepticalscience” is one of my favorite sites to send “skeptics” to. i love how it just knocks down the specious arguments one-by-one. The probability of the blocking event which caused the Russian heat wave neither increases nor decreases as global temperatures change. The great plains of the US experienced record high temperatures during the historic “dust bowl” in the 1930s, culminating in the summer of 1936. Whether this was a blocking event similar to what occurred in Russia may never be known, but two such events, 74 years apart, seem to be much more common that one in a thousand. It is less a question of the standard deviation as Norm suggested, but more a statement that the distribution in non-Gaussian, resulting in higher probabilities of both record highs and lows than expected in a true Gaussian distribution. The slight warming experienced over the 20th century is unlikely to increase the chances of these types of temperature extremes, as the extremes are several standard deviations higher than the mean, and are tied to weather events rather than temperature averages. The North American record high was set in 1913, hardly a year of record warmth, in general. As far as I know that’s quite true. But if a blocking event which causes a heat wave does occur, then global warming dramatically increases the probability of its being a record-setting heat wave, even a once-in-a-thousand-years record event. That’s the point of Rahmstorf & Coumou 2011. Rather than explain your error, I’ll simply suggest that you think about this more carefully. Well, thank god Dan H has set the scientific world straight! Who needs research when hand-waving will suffice. I mean, “Whether this was a blocking event similar to what occurred in Russia may never be known, but two such events, 74 years apart, seem to be much more common that one in a thousand” … wow. Add in a good saharan drought and the Russian event will seem downright common! Tamino has already given you one addition – the mean is increasing . The Hansen paper gives 3 different approaches using 1951-80 sigma, detrended sigma for ’81-10, and sigma for 81-10. All three give the same overall result – with each passing decade since the 1970s the local temperature anomaly distribution shifts to the right (gets warmer). This dispenses with 1 and 3, leaving us with 2 and 4. We can accept 4, this is a trite observation, the planet is warming. However, whilst I’m no mathematician (I’m in Electronics), I’ve noticed something at work and have reproduced it in Excel: A histogram of a timeseries with a trend in it is skewed, it rises more slowly than the original timeseries histogram and drops faster. I’ve just done some runs in Excel using the data analysis pack to make a normally distributed series of random numbers and for each new set this behaviour holds true. Like I say I’m no mathematicain, but I guess this is due to the rising trend. This is not however what Hansen finds, and this is the reason Hansen’s paper alarmed me. In figure 4 all of the curves for all periods in both summer and winter approach the x axis at around -3. Yet at the other side there is a positive going skew that has all of the post 1970 periods meeting the X axis above 3. 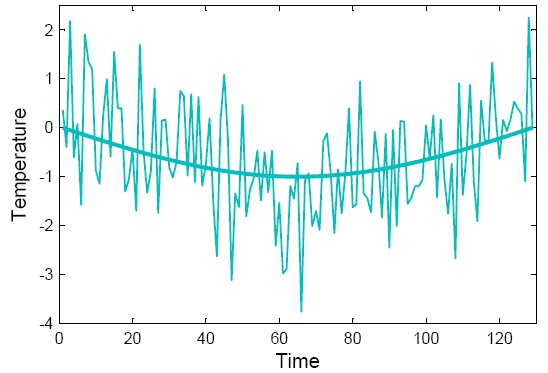 This suggests to me that what is going on is not simply a matter of the curves being shifted by a linear trend (change in mean) but is also a significant upward shift of variance. Yes, I think you explained my objection better than I did. If the odds are being beaten so easily there must be something wrong with the model. If you look at the model this thought experiment is on, there is simply climate variation. Rahmstorf and Coumou do discuss the possiblilities of higher variation, but they do not use it in their model. They also never try to model global warming, and only separate low frequency from high frequency data from local temperature record. Their trend line clearly has local climate variability, and they plainly state local warming is much higher recently than global warming. Hence you can not attribute results from this analysis to global warming. In other words smaller variation are indicated by warming but not these heat waves, the temperature anomolies. They suggest increasses in variability but sggest that anouther heatwave of this magnitude is unlikely in the next 50 years. It had been since the 30s for western russia to have a big anomaly. There is coupling so we can look back to the 1930s and find many anomalies world wide. For starters, global warming includes that 3/4 of the globe that is covered by the earth’s oceans. Warming over land, in particular the interior of large continents (as opposed to places like the UK or the Pacific Northwest which have maritime climates) is more pronounced. You seem to think global warming should be uniform, and that’s just not true. There are various Internet conventions, from emoticons to acronyms, which attempt to use plain text to convey a guffaw. I do not find any of them adequate.